England's neo-psychedelic wonder boys bring grand vision and more explosions to sophomore release Volcano. Three years ago, Temples went from YouTube group to full-fledged studio stars with mellifluous debut album Sun Structures, a pool of acid-washed sound and color deep enough to drown in. Now, England’s neo-psychedelic wonder boys are back with sophomore release Volcano, an album that sees them sharper, more polished, and ready to charge ahead into a retro future. From the outset, a strong sense of melody sets Temples apart from other rock groups. Opening track "Certainty" rises like a tidal wave, the band riding a tune both lofty and tremendous to great heights. On heavy synths and fuzzy guitar lines, it makes good distance before finally making landfall, crashing into the driving introductory beats of "All Join In". From there, the album draws heavily on '60s and '70s psych and proto-prog sounds while maintaining thoroughly modern pop sensibilities, and it quickly becomes apparent that Temples has an even grander vision for Volcano than for the already ambitious Sun Structures. Quiet moments are few and far between, and always exist for the sake of something larger. Explosions are the norm, bursts of soaring energy a constant presence. 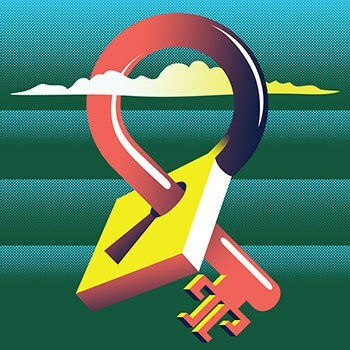 Typically, Temples stops short of real symphonic arrangements, and that’s for the best. Most songs carry enough volume to boost singer/guitarist James Bagshaw halfway into the stratosphere before he even gets started, and to try and shoehorn extra elements into the mix only complicates things. There are times that the group tries to emulate orchestral effects, particularly on tracks like "I Wanna Be Your Mirror" and "Mystery of Pop", and it comes off a little precious, with faux flutes and violins sounding a little dated and unnecessary. Those particular tracks are still good ones, definite crowd-pleasers, but it’s because of the strength of Temples’ core sounds, not the extra flourishes. And, for all the out-of-this-world fantasy in Temples’ repertoire, that core is a simple quartet: guitar, bass, drums, and keys support the vocals ably and with a new groove on each song. Tom Walmsley on bass and Samuel Toms on drum make for a particularly potent combination, playing a crucial role in anchoring the group as Bagshaw and keyboardist Adam Smith take the opportunity to go as far out as possible. Temples continually show a love of musical balance; it seems that the more weight Toms and Walmsley add, the more Bagshaw’s voice (which, it’s worth adding, indeed makes him sound like he’s been plucked right out of the forefront of the British Invasion) and Smith’s keys ascend. Single "Certainty" is a highlight. So is "Open Air", a cool pop rock song a little more stripped-down than most other tracks with just a hint of melancholy. "Oh the Saviour" demonstrates Temples’ knack for structure, starting with sunlit acoustic strumming and building up, higher and higher, until hitting almost otherworldly high notes. "Roman Godlike Man", for its overblown lyrics, has one of the catchiest choruses on the album, and "Strange Or Be Forgotten" ushers in sounds of '80s electronic pop to finish off the album. There’s something refreshing about how wholeheartedly Temples embraces genres that feel so closely tied to decades past. Nothing about the group’s approach feels like a rehash, though, and Volcano is an even better show of originality and commitment to personal musical style than any previous release. Temples’ affinity for psychedelia is an authentic one, and one that only seems to blossom more as the years pass.